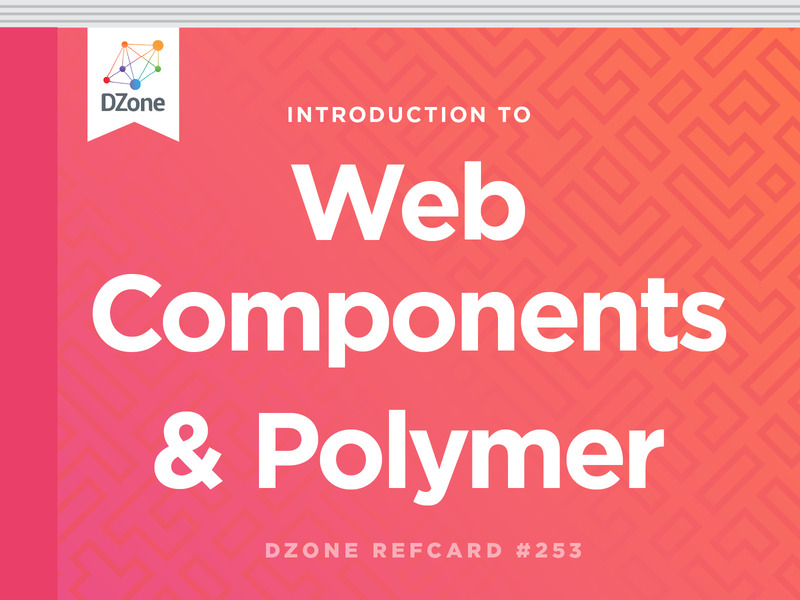 Download this new Refcard to learn more about Web Components. Newly named Java Champion Kito Mann walks you through the process from set up to using helpful libraries. Kito Mann Principal Consultant, Virtua, Inc.
► What is a Web Component? It’s no secret that it is easier to build a user interface out of reusable components. UI components allow developers to focus on the application logic rather than spend time reinventing a data table or drop-down list box. They also allow teams to build specialized UI components that can be re-used in different projects, or even across an entire organization. In fact, component models has been popular since the early 1990s with technologies such as Visual Basic, Delphi, PowerBuilder, WinForms, Windows Presentation Framework, ASP.NET, Swing, JavaFX, JavaServer Faces, Tapestry, and so on. iOS and Android have their own component models. In the browser, we’ve had plethora of component models over the years, including YUI, KendoUI, Bootstrap, jQuery UI, and Wijmo. Modern front-end frameworks such React, Angular, and Vue each have their own compponent models and enforce a component-centric development model. The <paper-action-dialog> and <paper-button> tags are fully encapsulated, with their own properties, methods, and events. No framework required. In order to get a sense of over 1,000 publically available Web Components, see webcomponents.org. CSS Custom Properties and CSS Apply Rule provide much of the power of CSS pre-processors such as SASS natively in the browser. Web standards are great, but they’re not very useful if browsers don’t implement them. Even if something is an official standard, it’s up to the browser vendors to decide whether or not to implement them, and when. The following table shows the current browser support for these specifications as of this writing, with links to , which provides up-to-date browser support info plus additional details. The table refers to the latest version of the browser (with the exception of IE11). When a browser doesn’t implement a standard, support can be added with a polyfill. The most popular Web Components polyfill is webcomponents.js. It supports all of the specifications listed above, and has the ability to only load polyfills for a specification if the feature is not supported in the browser. It is battle-tested, performant, and in production on many public and private apps, including the new desktop version of YouTube. Custom Elements can optionally implement several callbacks that get executed during their lifecycle. constructor() Called when the element is upgraded or created using document.createElement() or using the new keyword. Useful for initializing the Shadow DOM and performing any other initialization work that doesn’t involve attributes or “light DOM” children (child elements which are not part of the Shadow DOM). connectedCallback() Called when the element has been added to the DOM. Useful for initializing properties/attributes, fetching resources, light DOM children, etc. Most of the setup work should be performed here. attributeChangedCallback(attrName, oldVal, newVal) Called whenever an attribute value has been added, removed, or changed. Also called for the initial attribute values when the element is upgraded. Useful for handling any behaviorial side-effects of changes to attribute values. Note this is only called for attributes defined using the observedAttributes() static property (otherwise you would get a call everytime someone updated default attributes, like class or id). disconnectedCallback() Called when the element is removed from the DOM (someone called remove() on the element); useful for cleanup (such as removing event listeners). Note that this callback won’t always be called (for example if someone closes the tab). adoptedCallback() Called when an element is moved to another document. This happens when someone calls document.adoptNode(). This is not supported by the webcomponents.js polyfill. Note that these callbacks are synchronous, so make sure they are fast. In this case, we need to synchronize the property and attribute values. When the act of updating a property also updates the corresponding attribute, this is considered “reflecting to the attribute”. Only do this for primitive types; if the property is an Object or Array, you’re better off storing it as a normal property on your custom element (serializing large objects to the DOM as an attribute is expensive). // Store properties as attributes so they work both ways. // Don't store this property as an attribute because it changes frequently. So far, there isn’t much going on here. The static observedAttributes property tells the browser to only call attributeChangedCallback() when these attributes are set. The connectedCallback() method also registers the _onClick() method, which starts or stops the timer when the user clicks on it. In the stop() method, we add the ‘counter-disabled’ class, so it’s clear the timer has stopped, and remove the timer. This time, we fire a different custom event to inform users that the timer has stopped. * we stop the timer and remove event listeners. Here we stop the timer and remove the event listener. View a demo live on Plunker. The name must contain a dash (-) so the browser can distinguish between the custom element and regular elements. For example, <foo-bar> and <acme-tabs> are valid names, but <foobar> and <acme_tabs> are not. Most components use a prefix for the project of which they are part, in order to avoid namespace collisions. For example, instead of having a <basic-tabs> component, you might have a <acme-basic-tabs> component if your project was called Acme. The same name cannot be registered more than once (you will get a DOMException if this happens). Custom elements cannot be self-closing; you must always use a closing tag (e.g. <my-custom-element></my-custom-element>). You can extend custom elements just like any other class (see the following sections for examples). Although the spec mentions subclassing native elements (like <input> or <div>), Apple does not approve of this feature, and no browser currently supports it (see the status). There is currently a discussion about an alternative solution on GitHub. * Declare the template here so it can be re-used by multiple instances of the element. * is only parsed once. * Fires when an instance was inserted into the document. The first difference here is that we include the code inside of an immediately-invoked function expression (IIFE) so that we can declare the template element in a private scope (you could use a module to achieve a similar effect). This allows us to create and initialize the template so that it can be cloned by multiple instances of the component. HTML Templates can also be defined in pure HTML using the <template> element, but this approach ensures the component will work in a larger variety of environments. Inside of the connectedCallback() (which overrides the version defined in the superclass), we simply clone the template rather than building the DOM programmatically. Declare the template here so it can be re-used by multiple instances of the element. Here, we use an HTML template wrapped in an IIFE as in the previous example, but this time we create a shadow root in the constructor and append the clone of the template there. In the previous example, DOM manipulation was performed in connectedCallback() because the Custom Elements specification disallows creating children in the constructor. The constructor is, however, a fine place to create the shadow root and add children to it. connectedCallback() has been overridden simply to avoid building a light DOM, as the superclass does. There are a couple of important differences in the template. First, there is the :host CSS pseudo-class; this allows us to style the host of the shadow root, which is the custom element itself. In the markup portion of the template, there is also a new <slot> element. This will insert the content specified inside of the custom element by the calling document. Thanks to the <slot> element, the text “Shadow DOM Counter” is displayed within the vt-counter-shadow-dom custom element. (You can even provide named slots, which can be inserted in different parts of the Shadow DOM.) Moreover, the header style class from the including document is applied to the text, while styles declared within the element itself are not visible outside of the element. Child elements are not visible either, which means the <span> element with the id “value” is no longer in danger of having conflicts. In other words, Shadow DOM gives us full encapsulation of the internal structure of our custom element, but still allows the calling document to insert content into the custom element. Note that Shadow DOM works equally well without HTML Templates; you reap all the same benefits whether you build the DOM from a template, imperatively, or both. Polymer Google Polymer is the most popular library for writing Web Components. It provides several additional features such as automatic handling of properties/attributes and two-way property binding, which makes it possible to build entire applications with Web Components alone. It’s heavily used inside of Google for hundreds of projects including YouTube, and even within Chrome itself. Stencil Ionic Stencil provides a streamlined programming model using TypeScript and JSX that compiles to Vanilla Web Components. Additional features include data-binding, async rendering, Virtual DOM, and server-side rendering. Skate Skate Team Skate is an extremely lightweight library for writing web components that includes automatic handling of properties/attributes, a fast functional rendering pipeline, and support for different rendering strategies. X-Tag Microsoft X-Tag simplifies building web components by providing automatic handling of properties/attributes, simplified event handling, and more. One of the key benefits of Web Components is that they’re part of the Web Platform, so you don’t need a framework to use them. But what if you’re using Angular, React, Vue, or some other framework? Fortunately, generally speaking they work well with most other frameworks, especially if you follow the pattterns presented here and in Google’s excellent HowTo Web Component Examples. Good examples of this are the Vaadin Elements, which work with both Angular and React. And framework interoperability was one of the key reasons Ionic developed Stencil. Most frameworks now have some documentation about how to use Web Components, so consult your framework’s documentation for details. You can also see how your framework's Web Components support stacks up at Custom Elements Everywhere, which runs a battery of compliance tests for each framework and provides a score. virtua.tech - Expert training, consulting, and mentoring for Web Components, Polymer, and other technologies.